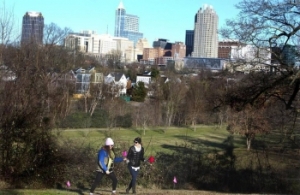 Raleigh residents’ property taxes could rise next year to help finance more affordable housing and the city’s acquisition of Dorothea Dix Park, the sprawling downtown property the city bought from the state last year. City Manager Ruffin Hall on Tuesday proposed increasing spending 3 percent for an $858.6 million budget for the fiscal year that begins in July, compared with the current year’s $832.5 million budget. The budget includes the equivalent of a 2-cent property tax rate increase that would generate about $11.4 million in additional revenue. Half would go toward financing debt the city took on to buy the 308-acre former Dix hospital property for $52 million. The other $5.7 million would go toward expanding Raleigh’s affordable housing program from 200 units next year to 325 units. The proposed tax increase would cost the owners of the average Raleigh home, which is valued at $251,300, an extra $95.16 a year. The proposed overall spending increase also includes higher fees for city services. The average Raleigh resident would see a 75-cent monthly solid waste fee increase, a $1 monthly stormwater fee increase to pay for 12 new jobs and a $1.99 monthly utility fee increase to fund infrastructure maintenance. The city manager’s proposal comes a year after Raleigh raised property taxes 1.72 cents per $100 in assessed value to fund debt for parks, and a day after Wake County Manager Jim Hartmann proposed a 1.35-cent rate increase for all county residents. The countywide increase taken separately would mean the average Wake homeowner would pay $36 more a year. Hall said he’s aiming to address the goals listed in the City Council’s strategic plan, a document adopted last year to place priorities on government actions. The strategic plan calls on Raleigh to find a sustainable funding source for affordable housing projects. The City Council is expected to consider Hall’s proposal over the next few weeks and vote on a budget after holding a public hearing June 7. Mayor Nancy McFarlane said she generally supports Hall’s proposal and sees no major plans that need changing. Aiding affordable housing, which McFarlane called workforce housing, will help nurses, teachers, firefighters and others who earn less than the area median income, she said. “These are people that are working hard but, as the city grows and the housing crisis rises and rises, get forced out of their homes and then all their expenses go up,” McFarlane said. “This is a moment that a lot of us have been waiting for a long time. It’s a growing need that’s not going away,” Councilman Russ Stephenson said. About 32,000 Raleigh residents are “cost burdened” in the city’s eyes, meaning more than 30 percent of their income goes toward rent payments. About 16,000 residents spend more than 50 percent of their income on housing, according to the city. Others, however, were skeptical a tax increase was needed. “I was under the impression we could buy Dix Park without raising taxes,” said former City Councilman John Odom, who served when Raleigh bought the land. Odom, a Republican, is running for the Wake County Board of Commissioners against Democrat Greg Ford. Dan Coleman, chairman of the South Central CAC, said he’ll only support the tax increase if the city fills the housing only with residents who make less than 50 percent of the area median income. He’s afraid the city will use it to house residents who make less than the median income but could afford housing near Raleigh’s urban core without assistance. “It can’t be a social-engineering tool to fill the urban core. The city should only do what the market cannot do,” Coleman said. On paper, it might appear as though Raleigh residents would pay less in property taxes under Hall’s proposal. Hall wants to lower the tax rate from 42.1 cents to 41.83 cents per $100 in assessed value. However, when adjusted to consider the recent countywide property reappraisals, Hall’s proposal would mean higher payments for Raleigh taxpayers. The city would need to adopt a rate of 39.83 cents per $100 in value to keep taxes as level as possible. Apart from the pursuit of more affordable housing, Hall’s plan seeks to shift how the city cleans up its downtown streets and sidewalks. His proposal creates a 15-member downtown crew in a new transportation department that assumes cleaning responsibilities from the Downtown Raleigh Alliance, a nonprofit with whom the city is negotiating a new contract. The move, which will cost $543,000, comes less than a year after the City Council acted on downtown residents’ complaints that noisy nightlife crowds were leaving sidewalks and parking decks dirty. Hall would also start the process of selling off some downtown properties to consolidate city offices into a new municipal campus on Hargett Street, next to where City Hall stands. The proposed budget includes money to find a replacement for Fire Station 1 on Dawson Street in the Warehouse District. The city plans to sell the 0.37-acre property where Station 1 is located, which Wake recently valued at $3 million. The city may be able to earn more than $3 million if it puts the land up for auction. The city last year sold its 1.2-acre property at 301 Hillsborough St. in downtown Raleigh for $6 million – twice its assessed value.